On this date in 1676, an indigenous Nipmuc named Matoonas was marched into Boston, condemned by a summary judicial proceeding, and immediately shot on Boston Common. Though he was a so-called “Jesus Indian” — a converted Christian — Matoonas had become a principal adversary of the European colonists once long-building tensions exploded into King Philip’s War. To the communal grievances that made up this war, Matoonas brought a very personal injury: back in 1671, his son Nehemiah had been accused by English colonists of murder and executed on that basis. And not just executed, but his rotting head set up on a pike at the gallows, to really rub it in. Matoonas bided his time, but when the opportunity to fight back arrived he joined King Philip (Metacomet) with gusto. On July 14, 1675, Nipmuc warriors under his command raided the town of Mendon, Massachusetts, leaving five dead — the very first Anglo casualties of the war. “A dark cloud of anxiety and fear now settled down upon the place,” a bicentennial a Rev. Carlton Staples recalled in a bicentennial address on Mendon’s history 1867. “With tears and lamentations they tenderly gathered the bodies of the slain and laid them away in some pleasant spot, we know not where. The houses and farms remote from this central point were abandoned, and the people fled to other places, or gathered here to save their flocks and growing crops. All sense of security was gone. They only dared to go abroad in companies. While some worked in the fields and gardens, others watched for the lurking foe.” A few months later, the settlers had to abandon Mendon altogether, and the Nipmuc burned the ghost town to the ground. But the tide of the war soon turned against the natives, and Matoonas would find that he had his own lurking foe. A mysterious Nipmuc leader known as Sagamore John (“Sagamore” designates a sachem or chief) betrayed Matoonas in exchange for a pardon from the Massachusetts colony, marching Matoonas and his son right into Boston on the 27th of July. After an improvised tribunal set down the inevitable punishment, Matoonas was lashed to a tree on Boston Common. Sagamore John performed the execution himself — although whether he volunteered or “volunteered” is not quite clear. The late Nipmuc raider’s head, too, was set on a pole — just opposite Nehemiah’s. 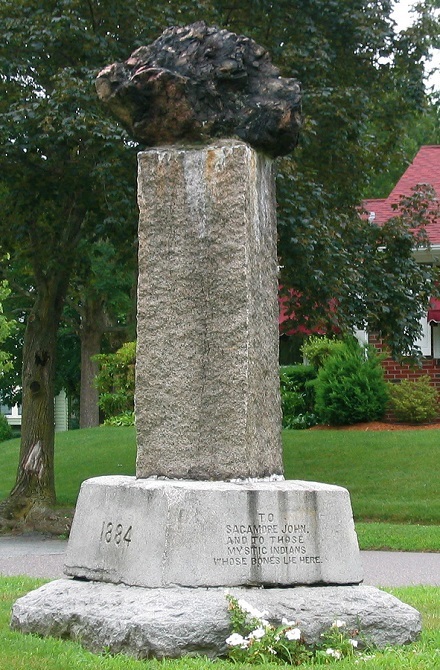 Memorial to Sagamore John in Medford, Mass. (cc) image from David Bruce.